Dr. John Barge is Running for Governor. I am Glad that He is Running! | Georgia Teachers Speak Out! ← Appointment of Edmond Heatley in Bermuda Causes Great Controversy! Dr. John Barge is Running for Governor. I am Glad that He is Running! Hey, hey…gonna be a showdown, a showdown! 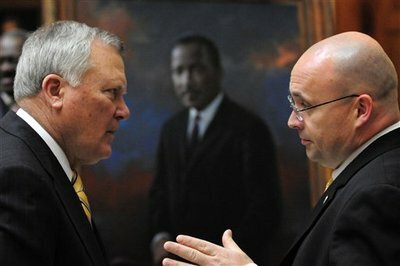 Governor Nathan Deal (L) versus State Superintendent John Barge (R). Deal’s been bullying Barge mainly because Dr. Barge does not goose-step to the demands of the U. S. Department of Education. Now, Dr. Barge is fighting back. Governor Deal seems to be a lap dog to U. S. Secretary of Education Arne Duncan relative to how teachers ought to be treated in Georgia. Deal seems to have a tin ear to the concerns of teachers. He seems more concerned over his “[D]eal-making” with the Feds. Barge, however, seems willing to charge against the Feds and to call for local control of public education in Georgia as well as for more humane treatment of Georgia’s teachers. It will be an uphill battle for a challenger to beat an incumbent governor. But, it has happened before. Sonny beat ole Roy in 2002. The lines have been drawn in the political sand here in Georgia. Therefore, let the battles begin! Photo by Rome News-Tribune. The push for Common Core is the adopted child of Bill and Melinda Gates. These billionaires, along with the Pearson group out of Great Britain, the largest publisher of textbooks, tests, testing materials, etc., in the world, gave millions upon millions to the National Governors Association (NGA) to legally “bribe” these governors to come out for a common core curriculum which could be used in all states in the union. A few years back, Pearson apparently realized that the American public educational scene (k-12 and undergraduate and graduate schools) was close to a trillion dollar industry. It is my understanding that Microsoft is already working on the apps for Common Core which will be sold to Pearson who in turn will sell them to the states and school systems. This whole Common Core imbroglio is about money, pure and simple. Bill Gates dumped about two billion dollars in his crusade for “small schools” (like the schools at Carver High and Therrell High in Atlanta). This mission has proven to be an academic flop. Unlike Carnegie and Ford and other philanthropists of the past, today’s Billionaires Club members (the Gateses, the Broads, the Waltons) apparently want to drive the educational agenda and dictate the terms. They apparently want to be the super superintendents! The MACE mantra has been this since the inception of MACE in 1995: “You cannot have good learning conditions until you first have good teaching conditions.” I just got off the phone with my sister, a retired First Grade teacher here in Georgia. She told me that she had just gotten through talking to a teacher who told her that they just didn’t have time to teach anymore. I applaud Dr. Barge for standing up for the children by standing up for the teachers!